Moms came down for a visit this weekend and brought her new dog Bob with her. 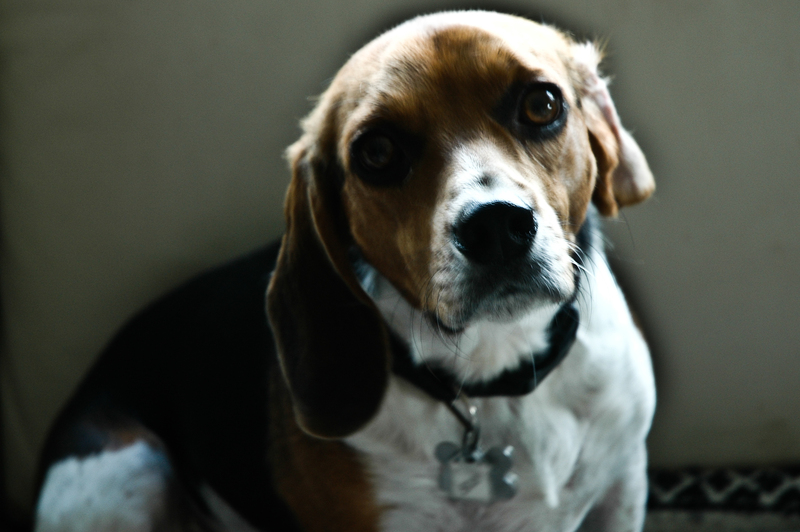 Bob is a three year old rescue and he’s part beagle and part something with short legs. He’s 20lbs. of heart wrench that walked into our house and decided he was in charge. And Cutter and Tug agreed. After he’d made the grand tour and sniffed everything and taken a poop in the middle of the living room, Bob jumped up on the couch, made himself nice and comfy on the pillows, and growled at Cutter and Tug if they dared join him. And since they are pussies they immediately backed down and spent the entire weekend cowering between my legs, hiding from the terrible Bob. Honestly, they are SUCH pussies. To make matters worse, or better, depending on your point of view, Miss Carol fell hard for Bob. He was soooo cuuuute she just couldn’t stop picking him up and hugging him and every time she did the boys would look up at me with their WTF? eyes. And I’d be like- sorry dudes. It got so bad that by the time Moms was leaving, Miss Carol carried Bob across the lawn and put him on his blankie on the back seat of Moms car. Then, while we were standing arm in arm waving goodbye she turned to me and said that she wouldn’t mind having a little dog like Bob around our house because he was soooo cuuuute and because she swore he’d had a little tear in his eye when she’d laid him down. So I hugged her and told her she’d probably been squeezing him too tight. hahahaaaaa! OMG. I didn’t hear that version at all! (go figure…). Too damn funny. Bob moved right in and let us know what was what. Nice of Bob to bring you a gift and leave it in the middle of the living room! Too funny. Miss Carol thanked him over and over again. I know how it is….I’m with Carol! Can I interest you in a Chihuahua…. with a slight attitude?